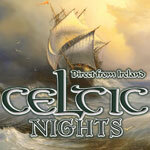 Drawn from the history and folklore of Ireland and her Celtic cousins, Celtic Nights will bring the audience on a stunning musical journey of a people leaving and arriving. Telling the tail of emigration and how people's lives would be spent in a world of travelling by rail, horses and ship's. With long days travelling on foot they would come and go, saving for fares and writing tales of their travels. Always having to compare what they had with what they might have elsewhere. A lot of time would be spent visiting others, always moving on the surface of a foreign land. A Constant journey of meeting, conversing and comparing, searching for a place better than Ireland or even half as good. The show Celtic Nights will bring you on this journey every second to a different place, filling you with laughter, sadness, melancholy, a sense of who we are and who our children will grow up to be. Passing the mantle of the legacy of their forefathers through music, song, dance and storytelling with pride and passion. The cast of three male vocalists and three beautiful female singers, six of Ireland's most talented and coveted international dancers and our fine musicians, will leave the theatre ringing with the sounds of Celtic Music old and new. Celtic Nights, a two hour showcase, of the rich heritage of the island and its culture, will bring us to that place that many emigrants now call home. The United States of America is where people from all lands have been welcomed through Ellis Island and the now adjoining Airports of New York City and beyond. The influence of the old music on what became American sounds - whether it be Bluegrass, Appalachian, Country and Western or the great songs and ballads, from Shenandoah to the songs of The American Civil War - will be a part of the Celtic Nights experience. Many of the old favorites -- Danny Boy, Isle of Hope and Whiskey in the Jar will be in there with, My Love is in America , May we never have to say Goodbye and may be a few surprises for the audience!